Multi-Step Forms Add-on lets you to easily transform Profile Builder Registration and Edit-Profile forms into Multi-Page forms on your website. Multi-Step Forms is an Advanced add-on, available with a Profile Builder Hobbyist or Pro license only. 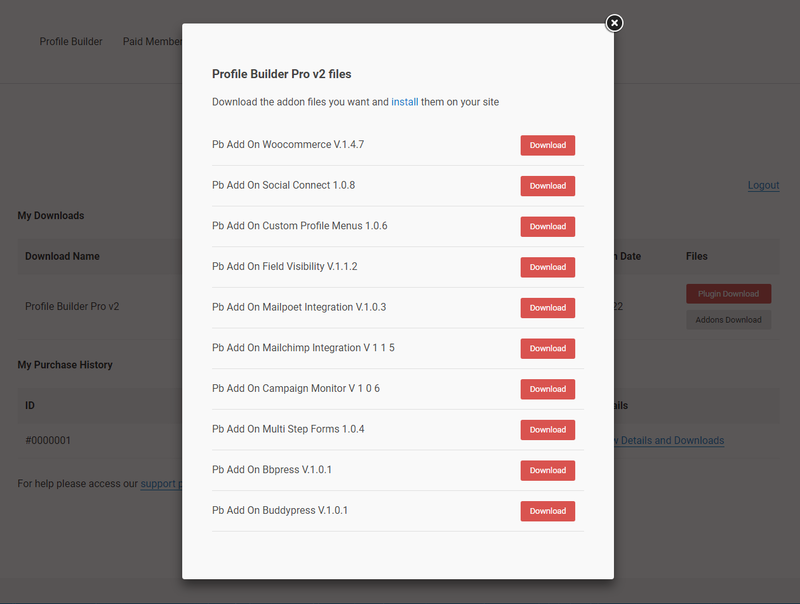 Alternatively, you can install the Multi-Step Forms add-on by extracting the folder found inside the archive and uploading the entire folder via FTP to your /wp-content/plugins folder found inside your WordPress install. 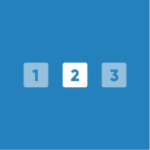 To Add a Form Break Point go to Profile Builder -> Manage Fields -> Hover over a field and you will see the “+” sign that you will need to click in order to add a Break Point. After you add the Form Break Point click on the “Update Multi Step” button. A successful notification will be displayed after you click on the “Update Multi Step” button. 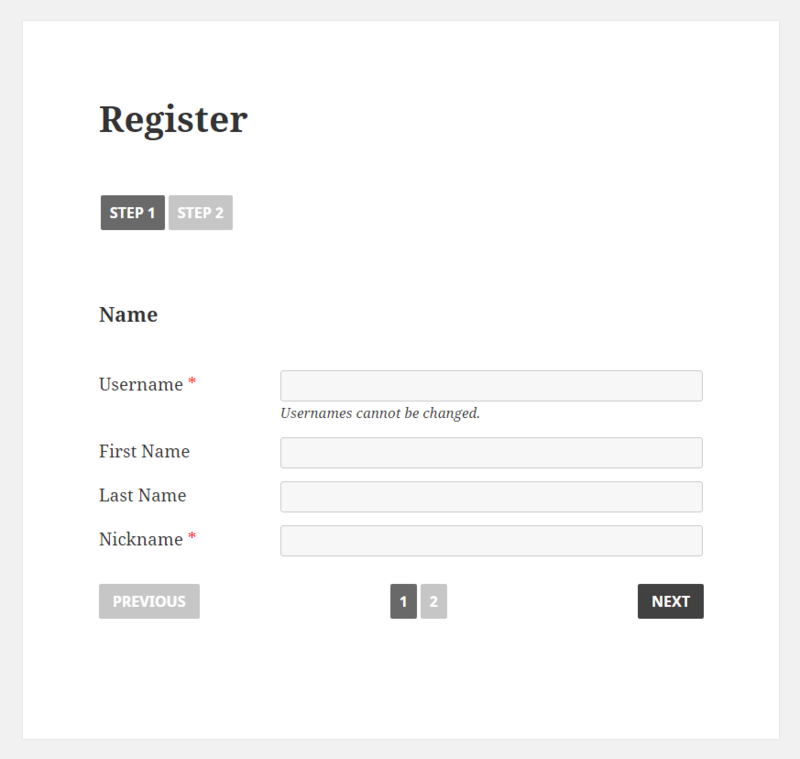 This is how the Registration form looks like in Front End. 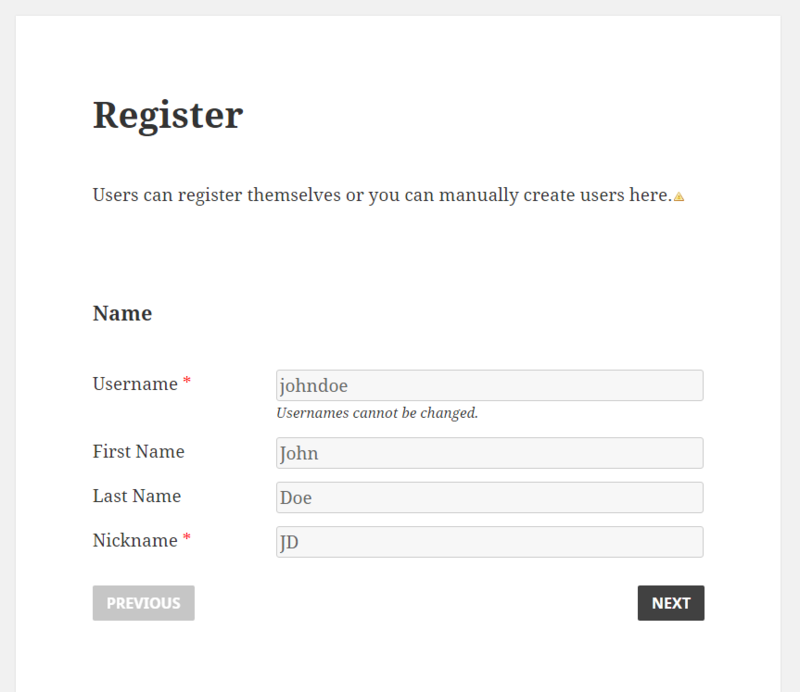 In the first Step the user needs to fill in the following fields: Username, First Name, Last Name, Nickname, as we defined the Form Break Point. After we finish filling in the fields the user needs to click on “Next”. The “Previous” button is disabled because this is the first step. 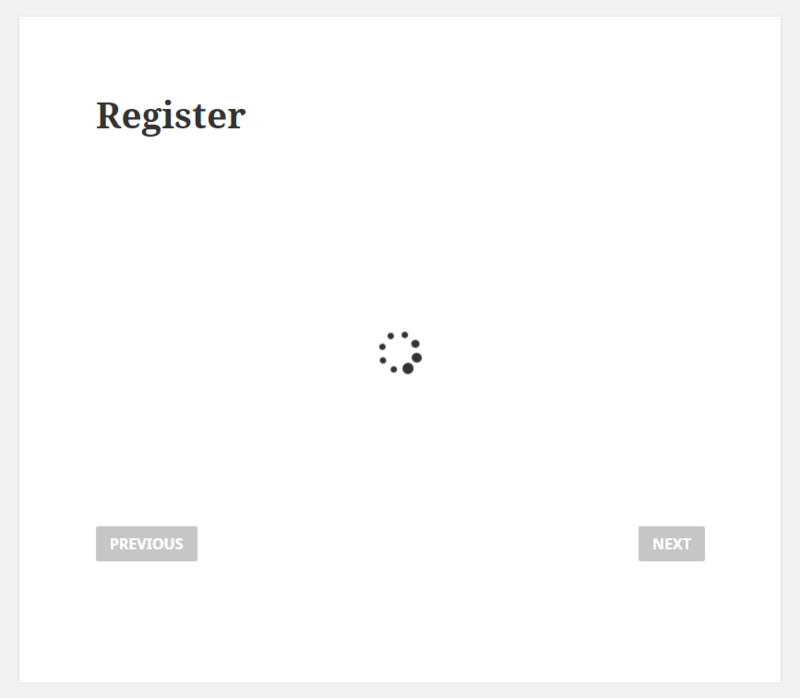 After we click on “Next” the form will be processed and a spinner will be displayed. 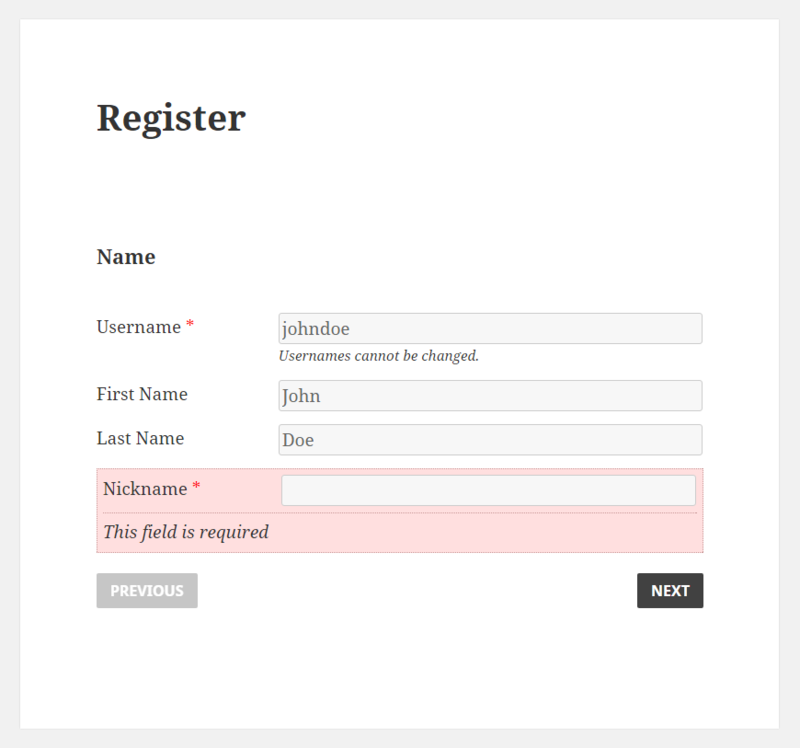 If the user didn’t fill in all the required fields he will not be able to go to the next step and an error will be displayed. Clicking on the “Next” button the user will be taken to the next step where he will be able to fill in all other fields and also to Register. The “Next” button is disabled because this is the last step. 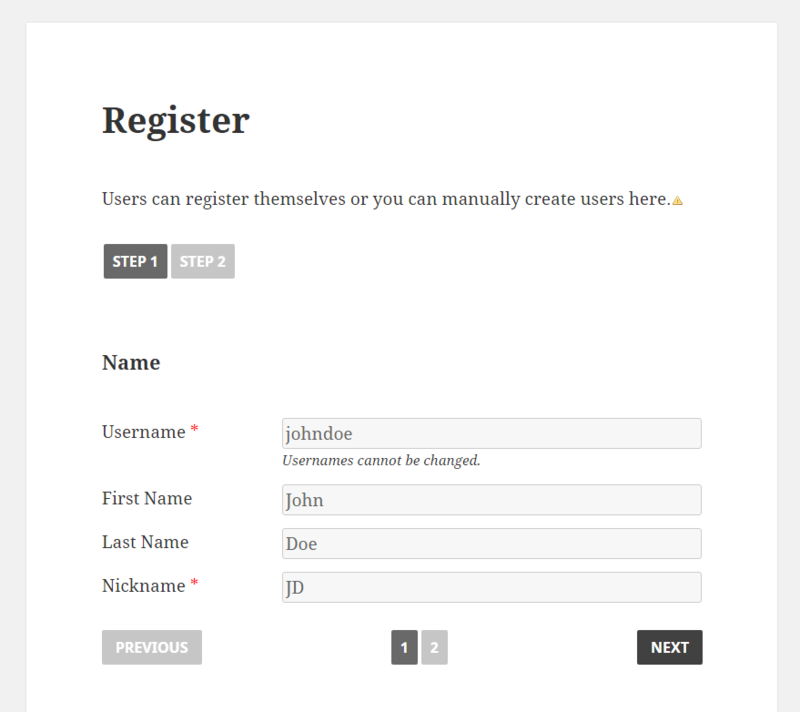 As Admin you can register users in Front End if you go to the Registration form. 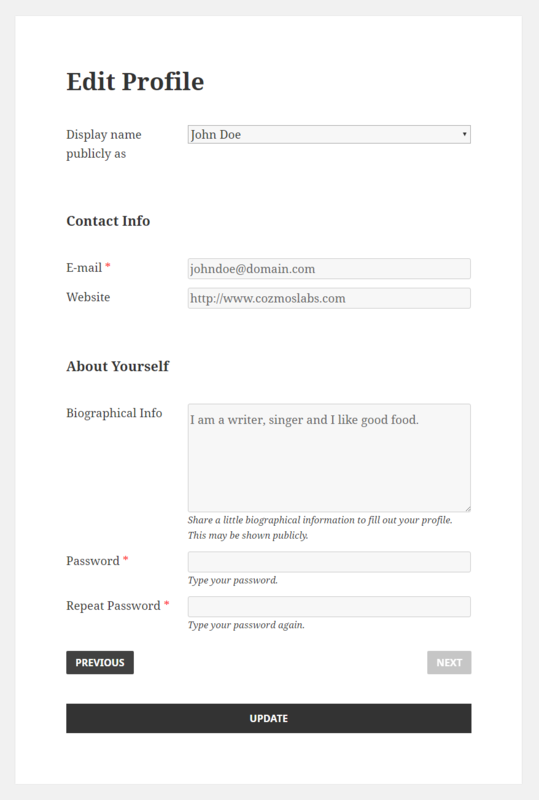 This is how the Edit Profile form looks like in Front End. 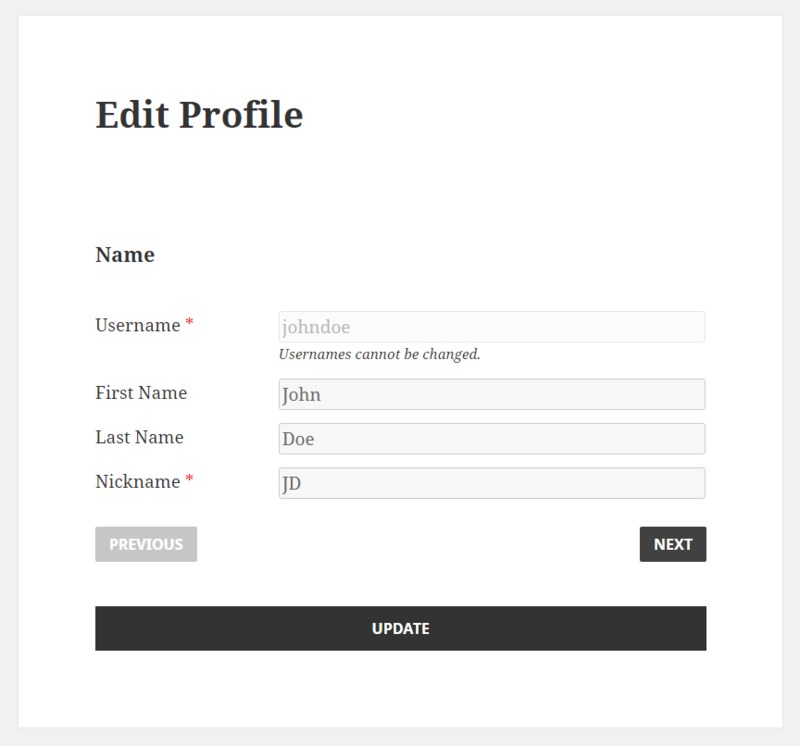 After Login users will be able to edit their profile if they access the Edit Profile Form. The “Previous” button is disabled because this is the first step. Users can update their profile in Step 1 and also in Step 2. If they have empty required fields an error will be displayed. The “Next” button is disabled because this is the last step. 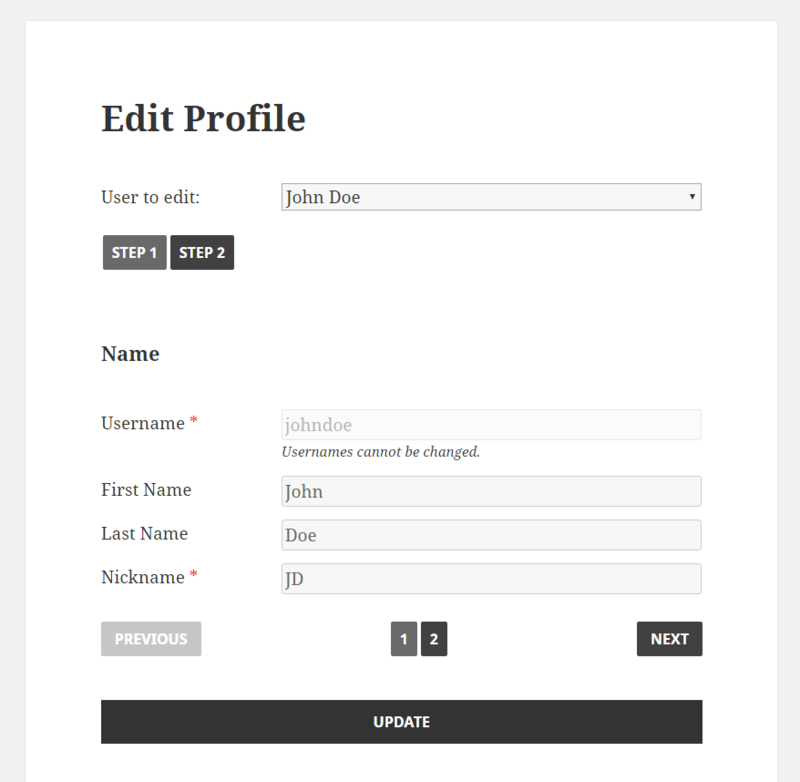 As Admin you can Edit User Profiles in Front End if you go to the Edit Profile form. 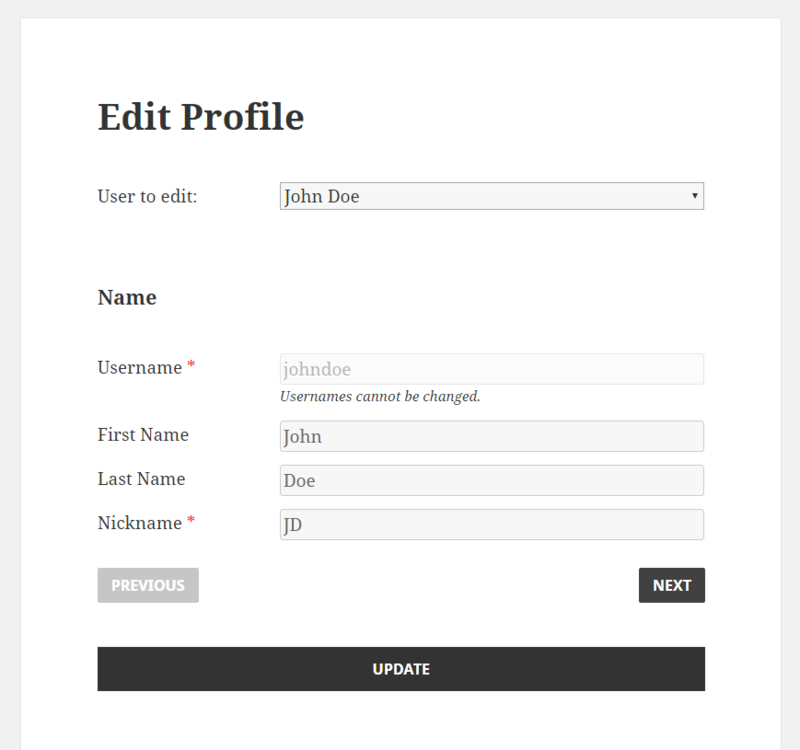 You will see a Select drop-down field called “User to edit” that you can use to select any user and edit their profile. 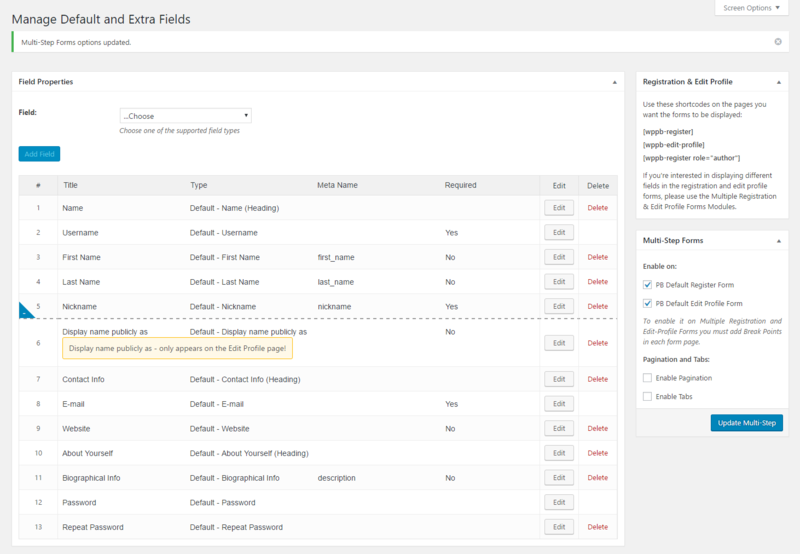 To remove a Form Break Point go to Profile Builder -> Manage Fields and click on the “-” sign. After you remove the Form Break Point click on the “Update Multi Step” button. A successful notification will be displayed after you click on the “Update Multi Step” button. 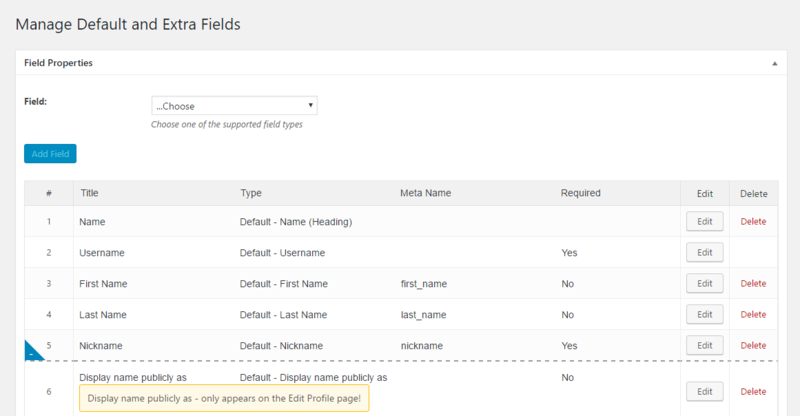 To enable or disable Multi-Step Forms on Profile Builder Registration and Edit Profile Forms you will need to go to Profile Builder -> Manage Fields -> Multi-Step Forms -> Enable on. After you check an option click on the “Update Multi-Step” button. 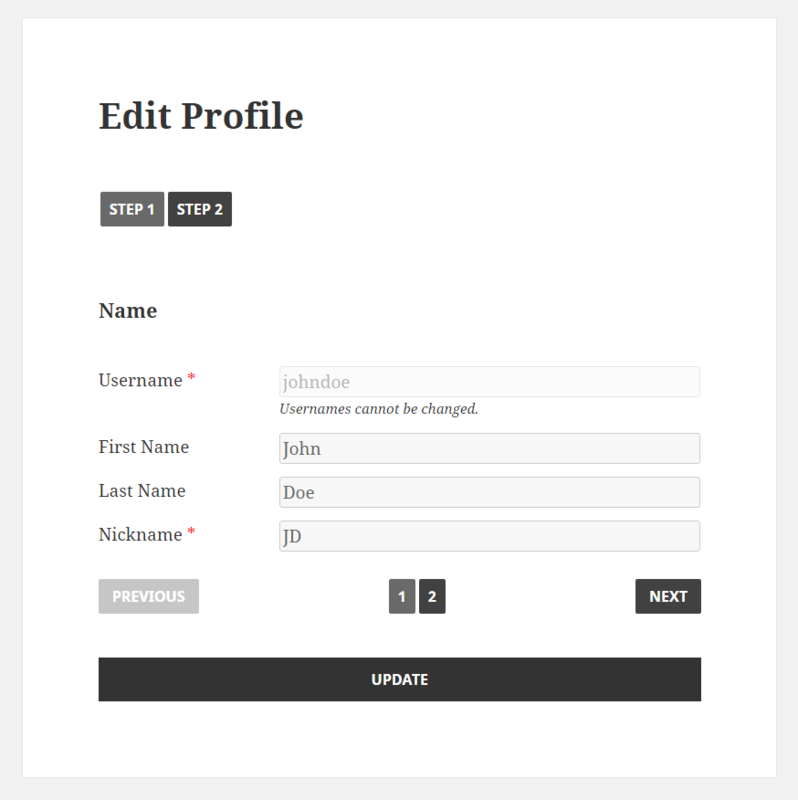 Inside Profile Builder Pro we have 2 modules called Multiple Registration Forms and Multiple Edit Profile Forms that are used to create Custom Registration and Edit Profile Forms with different fields for different user roles. 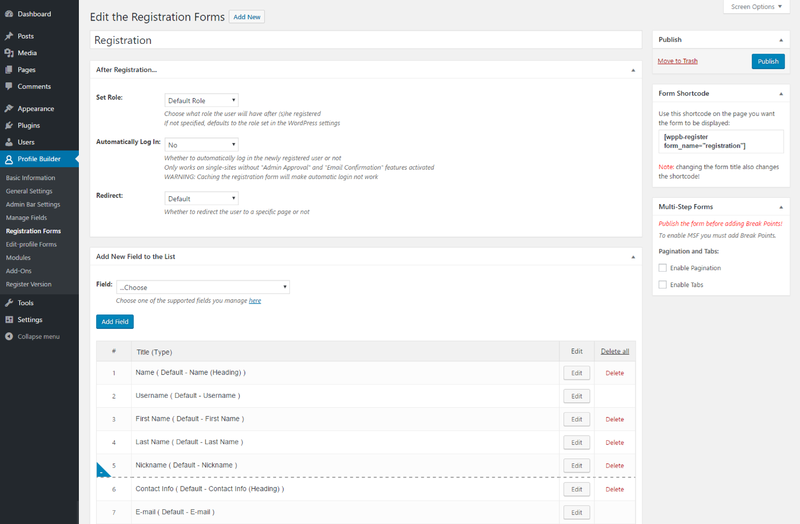 Inside the settings page we can choose if we want to enable Multi-Step Forms on our Custom Registration or Edit Profile Forms. 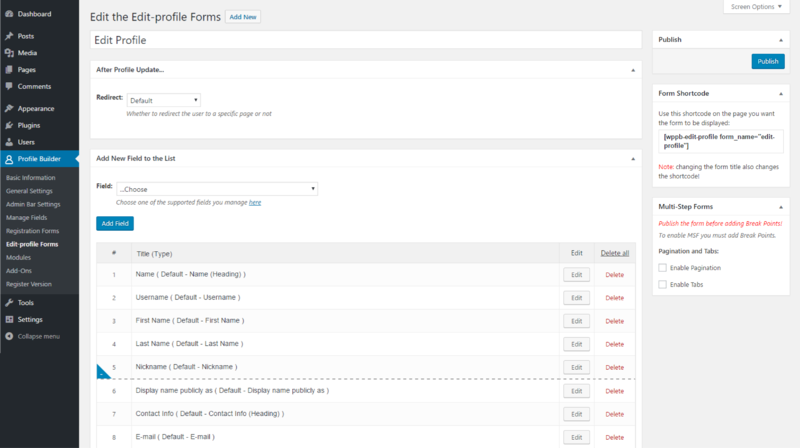 You can enable or disable Multi-Step Forms for each individual form. It only works with Profile Builder Pro. Publish the form before adding Break Points. 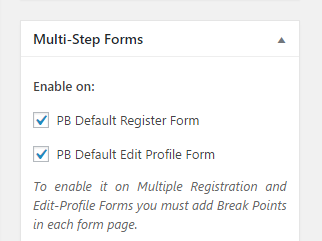 To enable Multi-Step Forms you must add Break Points. 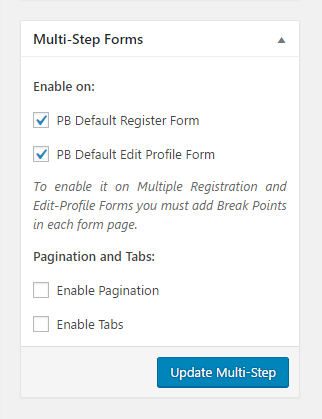 To enable Pagination and Tabs, in Multi-Step Forms, on Profile Builder Registration and Edit Profile Forms you will need to go to Profile Builder -> Manage Fields -> Multi-Step Forms -> Pagination and Tabs. Checking the “Enable Tabs” option lets you set the steps titles. After you check an option click on the “Update Multi-Step” button. 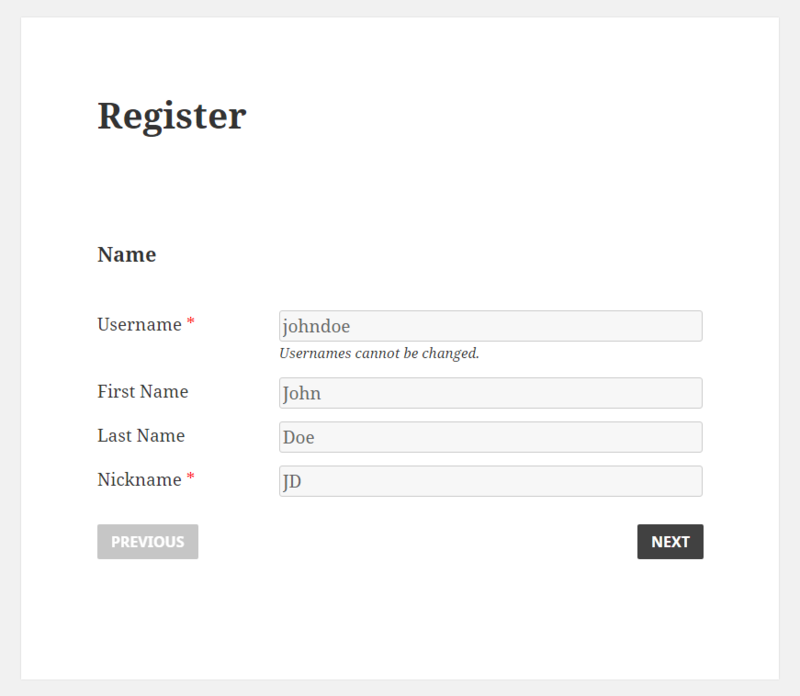 This how the Registration Form looks like in Front End when we enable Pagination and Tabs. 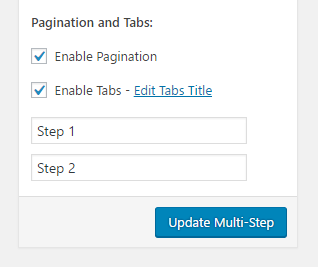 “Step 2” and “Page 2” buttons are disabled because the user needs first to fill in the fields from “Step 1”. 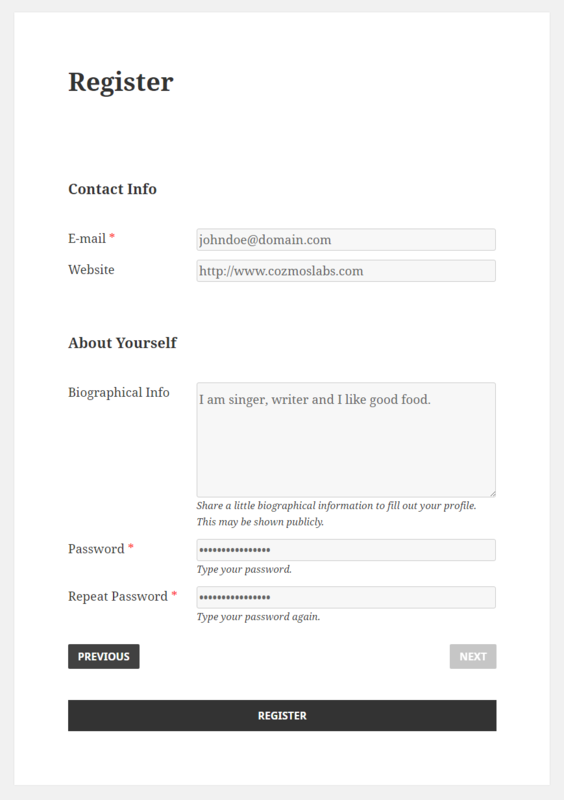 This how the Edit Profile Form looks like in Front End when we enable Pagination and Tabs. “Step 1”, “Page 1” and “Previous” buttons are disabled because this is the first step. Multi-Step Forms is an Advanced add-on, available only with a Profile Builder Hobbyist or Pro license.